Kelsey J. Mills is a poet, blogger and speculative fiction writer, and a good friend and critique partner. With her degree in psychology and personal experience, she’s a terrific resource. Her blog often includes posts on psychology, superheroes, and movies – and various combinations of these. Kelsey and I are exchanging guest posts this month. I mentioned that I have a deep interest in PTSD, especially how it is (or isn’t) portrayed in adventure or speculative fiction. Kelsey generously wrote me this terrific guest post to talk about it. Thank you so much, Kelsey! In return, I wrote her a double-post worth of information on the publishing industry. Check out her blog while you’re there – she’s got some great stuff there. I really wish I wasn’t an expert in PTSD. Of course, some of my expertise comes from having a Bachelor’s Degree in Psychology, but most of it comes from having PTSD as one of my various mental health diagnoses. Having PTSD has given me the opportunity to explore the mental health system and my own inner world and share it these observations on my blog. Because of this expertise, my dear friend BJ asked me to turn my focus to a group that the development of PTSD has only recently begun to be explored in: first responders. PTSD, or Post Traumatic Stress Disorder, is a mental illness that often develops after exposure to trauma, such as threats of death, serious injury or violence involving intense feelings of helplessness, horror or fear. It is important to note that these threats do not have to be directed at you to prompt the development of PTSD. PTSD, compared to schizophrenia or depression, is a recently recognised illness, having begun to come to the attention of medicine after the “shell shock” phenomenon in World War One. As it is currently understood, PTSD is a blend of intrusive memories of the traumatic event, avoidance of reminders of it, emotional numbing and hyperarousal. Hyperarousal doesn’t mean what the perverts out there are no doubt thinking it means–it means that the brain is in a constant state of awareness. PTSD, due to its medical roots, is largely thought of as a soldier’s disease. However, ANYONE can develop PTSD after being exposed to trauma. This includes victims of interpersonal violence, natural disaster survivors, and, as I’m going to focus on today, first responders. Most people exposed to a trauma don’t develop PTSD. Anyone can, but not everyone does. Many people exposed to trauma show symptoms of PTSD without developing the disorder. Research points out a genetic influence on the development of PTSD, as is the case with many psychological illnesses. It has also been discovered that PTSD is associated with differences and changes from a healthy brain. The brain of someone with PTSD shows changes in the areas of the brain that process memory, fear, and reasoning, as well as in the neurochemicals of the brain. Most things in psychology are a chicken or egg situation: did these brain things lead to the development of PTSD, or were these brain things from the PTSD? The flood of neurochemicals in stress times could contribute to formation of strong memory of event, for example. The research into the development of PTSD in first responders is filled with contradictions. On the one hand, police officers have been shown to be slightly more resilient to developing PTSD than the average citizen due to their training. On the other, repeated exposure to traumatic events has been shown to increase the likelihood of developing PTSD. One factor that seems to contribute to the development of PTSD in first responders is the speed that calls are responded to. For example, one third of first responders to the World Trade Center attacks in New York developed PTSD, while only 7–34% of police officers completing regular duties develop PTSD. The time shortly after trauma can also have an effect on the development of PTSD. 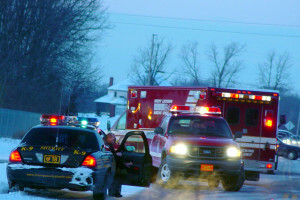 Continued distress in the time shortly after exposure to trauma, such as a stressful investigation, can also contribute to the development of PTSD. My belief is that the stigma associated with PTSD contributes to the lack of accurate portrayals of the illness. This stigma is as old as the recognition of the illness: When soldiers came home from war with “shell shock”, they were often treated as failures or dishonourably discharged. This stigma has led to PTSD being poorly understood by the general public and even the mental health community. Many writers probably, under the “write what you know” advice, have stayed away from writing about this illness. Accurate portrayals of PTSD aren’t seen as interesting either. As Tor has previously covered, therapy isn’t interesting. It’s hard work and it’s important, but it’s not full of grand revelations and inappropriate relations like the movies would have you believe. The illness of PTSD itself takes the sufferer out of action, so to speak. The illness takes someone away from themselves and their life. Without proper research, one might assume that this means that writing someone suffering from PTSD is a distraction from the main plot rather than a way to enhance characterization. This also comes from the idea that mental illness is untreatable, and that unless a character is “crazy” their illness serves no purpose in the story. Why should it be portrayed? To paraphrase the Canadian Prime Minister Justin Trudeau, “because it’s 2016”. Representation matters, it’s just that simple. I feel that it does a disservice to the brave men and women who risk their lives to protect us every day when we do not show them to be human, to be vulnerable. The beauty of speculative fiction is that it enables authors to tell stories about moral, ethical and complex problems in a unique way that gives people the distance needed to think about the struggles of society and our place in the world. Representing PTSD in such work shows the aforementioned heroic men and women that their experiences are heard, and that they are not alone.